This year’s recital will be undertaken in conjunction with the Russian and French departments. We’ll be looking at music for and about children and learning how legends, fairy-tales, and cultural attitudes toward children have shaped the music of Debussy, Ravel, Satie, Faure, Medtner, Tchaikovsky, and many others. This recital featured collaboration with the departments of art and geology. We all first convened on the shores of Lake Michigan and learned about water, rocks and the passage of time. While artists fashioned sculptures out of natural materials on the beach and pianists prepared a program of works about water, ephermerality, and the natural world. We later presented the program at both Bjorklunden and the Lawrence campus, accompanied by explanations from geologists and slides of shore-line sculptures. For this year’s studio recital we did “Music of 1917—One Hundred Years After.” This was a memorial concert for the years of WWI, with all music drawn from 1917. See both the program and program notes here. For this years’ studio recital, we performed music inspired by works of literature and coached with two drama professors to make the readings as effective as our music-making. A whole weekend at Björklunden was devoted to seeing how playing the piano corresponds with being an actor—we talked about projection, and building tension, and emphasizing consonants, and breathing between phrases. And later in the year, we presented three concerts at the OshKosh Correctional Institution. For more details, look for my upcoming article in American Music Teacher entitled “Keys Behind Bars.” Prisoners wrote multiple letters of thanks afterwards, and students found the experience revelatory. We returned for 3 more concerts in 2017 and will do so again in 2018. Homages paid by 21st century composers to composers of the past. The late 20th century seems to represent a mellowing of compositional styles; composers seem less determined to break with the past and happier to befriend it. Every new piece you’ll hear in this concert is conceived as an homage. In some of the pieces only the spirit of a composer is evoked. In others, the composer is directly quoted. And even those that use quotation differ wildly—some use the quotation in sharp contrast to what goes before and after; others move between centuries gently, almost imperceptibly; yet others create a vertical contrast, with centuries appearing simultaneously. In every case, the composers of the 20th and 21st centuries write music that is more fractured than that of their predecessors, more prone to discontinuity and irrationality. Often the past appears as a dream, other-worldly, intangible. But always it retains its power, and we hear it in new ways through the ears of our own century. Our studio project this year was a performance of the entire Bach Goldberg Variations and the set of 12 Variations by contemporary composers that were written for the Gilmore Festival in 2004. 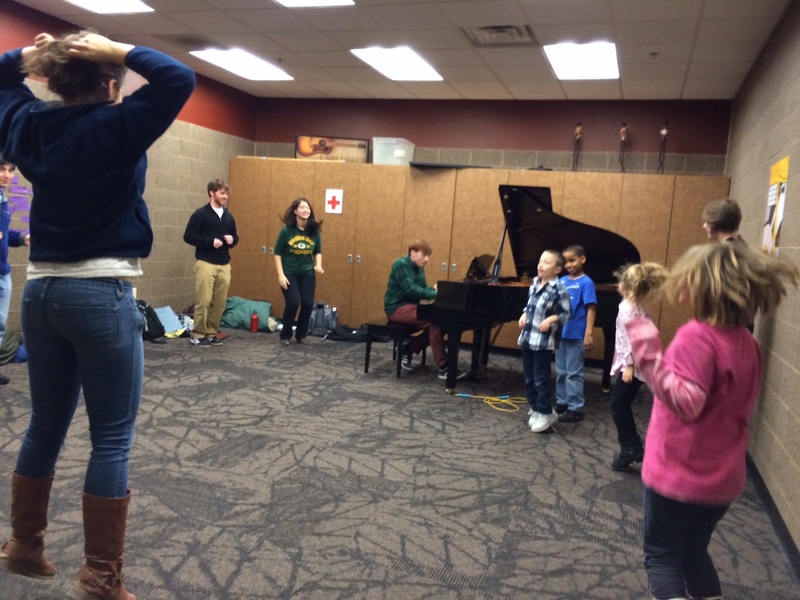 We performed excerpts at Lawrence’s off-campus retreat, Bjorklunden, and at the Boys and Girls Club of Appleton and performed the entire set in Harper Hall at Lawrence. In past years, we’ve done projects involving piano music written in reference to literature, programs of 21st century duos, and programs in conjunction with the theater department. Every year offers new opportunities! Here’s a brief portion of our Feb. 4 studio recital featuring the entire Bach Goldberg Variations as well as the entire 13 Ways of Looking at the Goldberg, which gives a a contemporary take on Bach’s monumental work. The program can be found here. My studio has recently been very busy doing outreach concerts. We received a grant from Lawrence and the local music store to move a piano to the Boys and Girls Club, and we’re also doing performances at a local soup kitchen. We love the idea that classical music is not for geeks only, and we want to make it available to people in the community who may have had no exposure, but may find out they love it. Here’s a sample program (DOCX). Since 2016 my students have been presenting 3 concerts each year at the OshKosh Correctional Institution. We’ve been featured on TV, covered by the Post-Crescent, and appeared in Lawrence Today and even the national publication of the MTNA, American Music Teacher. Gershwin Cuban Overture from the Saarburg Chamber Music Festival played by Craig Jordan and Noah Vazquez here. Watch Jonathan Fagan, our studio’s jazz/classical guru, performing on Wisconsin Public TV (0-18′ on this clip).